Advertisement fees paid by Google India to Google Ireland for purchase of ad space on Google’s AdWords Program are chargeable to tax in India as royalty income, and taxes should accordingly be withheld. Use of confidential information and customer data would constitute the right to use IP. Activities performed under Distribution Agreement and Services Agreement cannot be divorced as they relate to services in respect of Google AdWords program. Recently, the Income Tax Appellate Tribunal (“Tribunal”) rendered a ruling1 classifying payments made by Google India Private Limited (“Google India” or “Google”) to Google Ireland Limited (“Google Ireland”) for purchase of advertisement space on Google’s AdWords program as royalties. The Tribunal held that since royalty payments would be subject to tax in India, Google India should have withheld tax on the same. Information technology (“IT”) services and information technology enabled services (“ITeS”) under a services agreement dated April 1, 2004 (“Services Agreement”). The diagram below illustrates the scope of Google’s activities vis-à-vis Google Ireland. Google AdWords is an online advertising service developed by Google, where advertisers pay to display brief advertising copy, product listings, and video content within the Google ad network to web users. The program uses the keywords to place advertisements on pages where Google thinks they might be most relevant. Advertisers pay when users divert their browsing to click on an advertisement. AdWords enables an advertiser to change and monitor the performance of an advertisement and to adjust the content of the advertisement. During assessment proceedings relating to financial years 2006-07 to 2011-12, the assessing officer (“AO”) noticed that in its books, Google India had credited an aggregate sum of around INR 1457 crores (approx. USD 225 million, at today’s exchange rates) to the account of Google Ireland without withholding taxes. Google India explained that these amounts were payments for purchase of AdWords Space under the Distribution Agreement and would be characterized as business income in Google Ireland’s hands. In the absence of a permanent establishment of Google Ireland in India, such income would not be liable to tax in India under the Income Tax Act, 1961 (“ITA”) read with the India-Ireland Tax Treaty (“Ireland Treaty”). However, the AO treated the payments as royalties on which tax should have been withheld by Google India. Aggrieved, Google India appealed to the Commissioner of Income Tax (Appeals) (“CIT(A)”). The CIT(A) upheld the order of the AO. Aggrieved, Google India preferred another appeal to the Tribunal. Whether the amounts credited in Google India’s books to Google Ireland’s account constituted business income or royalties for use of software, trademarks and other intellectual property rights? Google India’s marketing and distribution functions involved the sale of certain rights in the AdWords Program, for which Google India required a license to use the AdWords Program. The distribution rights granted to Google India under the Distribution Agreement were therefore in effect a license to use Google Ireland’s intellectual property i.e., inter alia the copyright in the underlying software code of the AdWords Program. The Tax Authorities concluded that the license of Google Ireland’s intellectual property to Google India under the Services Agreement was actually for the purpose of providing the post-sale services under the Distribution Agreement, and therefore the payments made to Google Ireland constituted royalties. The non-disclosure agreement (“NDA”) and a confidentiality clause forming part of the Distribution Agreement clearly demonstrated that the payments to Google Ireland were for information, know-how and skills imparted to Google India. Google India has been permitted to use Google Ireland’s trademarks and brand features in order to market and distribute the AdWords Program. The grant of distribution rights involves transfer of rights in ‘similar property’ (Explanation 2 to Section 9(1)(vi) of the ITA). The grant of distribution rights also involves the transfer of right to use Google Ireland’s industrial, commercial and scientific equipment i.e., the servers on which on which the AdWords Program runs. The grant of distribution rights also involves transfer of right in processes, including Google Ireland’s databases software tools etc., without which it would not be able to perform its marketing and distribution functions. The distribution rights granted to Google India under the Distribution Agreement did not involve a license to use Google Ireland’s intellectual property. The Services Agreement and the Distribution Agreement should not be read in a conjoint manner. Google India submitted that the limited license it receives to Google Ireland’s intellectual property under the Services Agreement is only for enabling the provision of quality control and IT/ITeS services for which it receives a separate consideration. Google argued that these services provided by Google India are to ensure that ads placed by advertisers globally confirm with Google’s editorial guidelines and the local laws of the country from where the ad originates. These services are not linked in any manner to its AdWords Program distribution function. Its AdWords division and the ITeS division operate separately and there is no overlap of any activities and responsibilities between the two divisions. purchasing online ad space in the AdWords Program from Google Ireland for resale to advertisers in India. performing marketing related activities in order to promote the sale of ad space to advertisers in India. providing assistance and training, where required, to Indian advertisers to familiarize them with the features and tools of the AdWords Program. No information, know-how and skills were imparted to Google Ireland. The Tax Authorities alleged this on the basis of the NDA and confidentiality clause which is intended only to protect confidentiality of the information, if any, which either party gathers during the course of the business. Such clauses are generic to most agreements and cannot per se establish that there is a right to use Google Ireland’s intellectual property. The right to use the Google trademarks and brand features granted to Google India were merely to enable Google India to distribute the ad space in India, and were incidental to the main purpose of the distribution agreement which was the sale of ad space. Google India submitted that the mere use of brand name for procuring ad contracts would not amount to use of trademark. The distribution rights are commercial rights and cannot be rights in ‘similar property’ for the purposes of Section 9(1)(vi). In any case, the definition of royalty under the Ireland Treaty does not contain the words ‘similar property’. Google India does not have access to or control over any back-end processes such as databases, software tools etc., under the Distribution Agreement. Google India neither receives any right nor access to the AdWords Program under the Distribution Agreement and does not use it in any manner whatsoever. The payment to Google Ireland is merely towards purchase of the ad space for resale without access to any underlying computer program. Accordingly, Google India argued that the payment to Google Ireland is for purchase of ad space which is in the nature of business income. In the absence of a permanent establishment of Google Ireland in India, such income would not be taxable under the ITA read with the Ireland Treaty. Whether the amounts credited in Google India’s books to Google Ireland’s account constituted business income or royalties for use of software, trademarks and other intellectual property rights. Whether distribution rights amount to license of intellectual property? Based on information regarding the AdWords Platform provided by the Google India, information available on Google’s website and in books available in the public domain, the Tribunal concluded that the Distribution Agreement was not merely an agreement to sell ad space but rather is an agreement to provide services to facilitate the display and publication of an advertisement to targeted customers with the help of technology. The Tribunal was of the view that the AdWords Program gives an advertiser a variety of tools to enable it to maximize attention, engagement, delivery and conversion of its advertisements. The tools are provided using Google’s intellectual property, software and database (including data on numerous individual web-users and their name, age, gender, location, phone number, IP address, habits, preferences, online behavior, search history etc.) with Google India acting as a gateway. The Tribunal was of the view that the use of customer data for providing services under the Service Agreement was also utilized for marketing and distribution functions under the Distribution Agreement. It concluded that the use of customer data and confidential information should be regarded as the use of Google Ireland’s intellectual property by Google India. The Tribunal concluded that it is through use of Google’s intellectual property that the AdWords tools for performing various activities are made available to Google India and the advertisers. Therefore, payments made to Google Ireland for use of its intellectual property would therefore clearly fall within the ambit of "Royalty". Google Ireland’s IP not incidental to the activities of Google India: Under the Distribution Agreement, Google India was permitted to use Google trademarks and other distinctive brand features of Google Ireland. The Tribunal concluded that such use was essential and pivotal for Google India to market and distribute the AdWords Program. The Tribunal distinguished the rulings in Sheraton2 and Formula One3 and held that the brand features were used as marketing tool for promoting and advertising the ad space, which is the main activity of Google India and therefore would not be incidental to Google India’s business. Distinguishing from precedents: The Tribunal did not place reliance on the reports of the OECD Technical Advisory Group (“TAG”) and the CBDT’s High Powered Committee (“HPC”) which had concluded that payments arising from advertisements would constitute business income. The Tribunal distinguished the reports on the ground that the fact patterns dealt with therein were vastly different from the facts in the present case. In the present case Google India has been provided access to the IPR, Google brand features, secret process embedded in AdWords Program as tool of the trade for generation of income. On the same basis, the Tribunal also distinguished this case from earlier Tribunal rulings in Right Florist4 and Pinstorm Technologies5 and Yahoo6 where courts had held that payments made to a foreign company for banner advertisement hosting services would not constitute royalties. 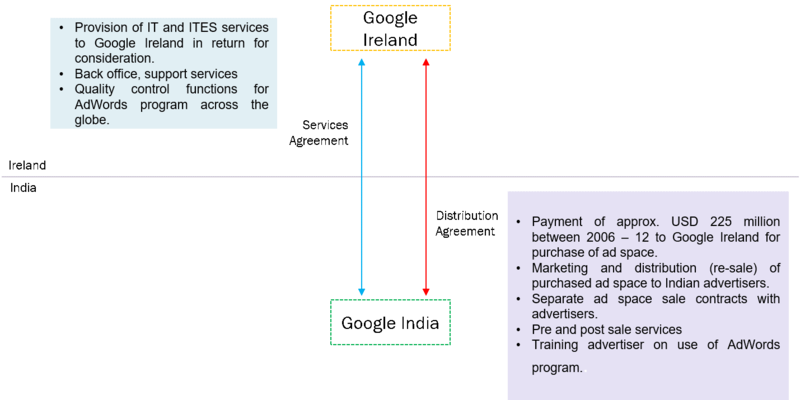 Whether the Services Agreement and the Distribution Agreement should be read together? The Tribunal held that under the Distribution Agreement, Google India was solely responsible for providing all customer support services to the advertisers through use of Google Ireland’s data and intellectual property. While Google India could afford to provide these services to the advertisers under the Services Agreement (under which Google India received a license to Google’s data and intellectual property), but services were instead rendered under the Distribution Agreement. In the Tribunal’s view, without Google India exercising its rights under the Services Agreement, it could not discharge its obligation under the Distribution Agreement. Thus, the Tribunal concluded the services rendered under Services Agreement cannot be divorced with the activities undertaken by Google India under the Distribution Agreement. The bifurcation of agreements was only a design / structure prepared by Google India to avoid the payment of taxes. The Tribunal appears to have undertaken an intensive fact-finding mission to unearth the technological workings of the Google AdWords Program on the basis of which it has concluded that the distribution rights involved a grant of license to intellectual property and advertisements fees were in the nature of royalties. The Tribunal’s ruling is also of interest for its clear break with earlier positions taken by Tribunals on the characterization of advertisement revenue, and payments made under distribution arrangements. Historically, in case of distribution arrangements, courts have ruled the payments to be in the nature of business income. In these cases, the question is usually whether the foreign entity has a permanent establishment (PE) in India for income to be taxable in India. In fact, the issue in such cases has been on the determination of a PE on account of a fixed place or dependent agent rather than whether such an arrangement will result in royalty income. Similarly, in the past, Tribunals have held that income from advertisements should be in the nature of business income, not taxable in India in the absence of a PE. In fact, it was for this very reason that the equalization levy was introduced to capture advertising fees within the Indian tax net, in cases where the non-resident does not have a PE in India. Importantly, the Tribunal has taken an aggressive approach where it has read two independent agreements in relation to services provided by two different units of Google India together to show that there was utilization of IP by the Indian entity and re-characterized the nature of income. The ruling does not provide for reasons of tax avoidance for clubbing the two agreements. Going forward, the taxpayer should expect a fair amount of scrutiny especially considering that the General Anti Avoidance Rules specifically grant the tax department, the power to re-characterize income. The ruling could have far reaching implications from businesses across the board. Utilization of IP such as customer data, confidential information for performing services is a fairly common industry practice and the ruling raises concerns on these type of arrangements. Google India has issued a public statement conveying its intention to appeal the ruling. Therefore, the issue is still open and we await the High Court’s ruling for further clarity.